I've been having a whale of a time with life lately! Plenty of good concerts, good football, good friends. Unfortunately, it's put me a day behind on Inktober, but I hope you can grant me grace there. Trust me though, all days will be accounted for, albeit a few days late. Speaking of whales...that's the prompt for day 12..."whale." For some reason, Spongebob Squarepants has come up a lot lately? Random references from random pieces of my life that I can't really understand, but was perfect for this odd day 12 prompt. 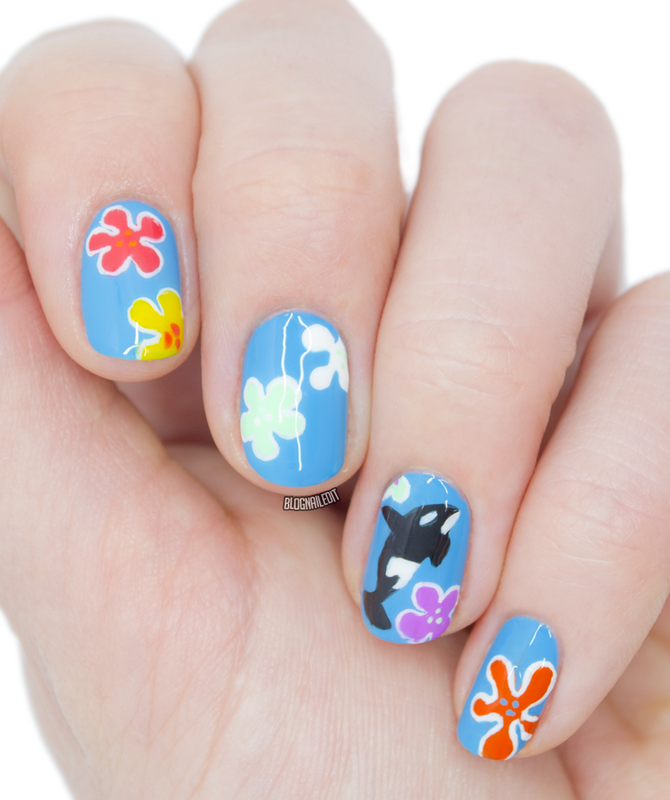 I used the Bikini Bottom floral designs as part of my whale nail art, and of course, the most striking "whale", an Orca (although they're not technically whales). Pairing the whale with all these bright colors takes the killer out of its name. The base blue is Sunday Funday (China Glaze), and the flowers are some other China Glaze shades including That's Shore Bright, Highlight of my Summer, I Brake for Colour, "Sun's Up, Top Down", and an essie orange called Roarrrrange. I have an idea for day 13, which is "guarded," so come back tomorrow to see if it pans out!